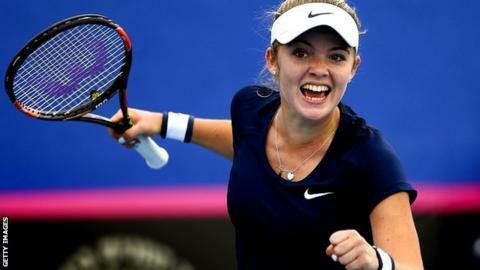 Teenager Katie Swan upset world number 327 Ekaterine Gorgodze as Great Britain beat Georgia 2-1 to set up a Fed Cup promotion play-off on Saturday. Swan, Britain's youngest ever Fed Cup player at 16 years old, won 6-3 6-3 in the opening contest of the best-of-three tie in Eilat, Israel. Heather Watson then beat Sofia Shapatava 6-2 6-0 to ensure Britain top Pool B in Europe/Africa Group 1. Britain will play Belgium in Saturday's play-off. Another victory there would see Judy Murray's side progress to a World Group II play-off in April, and the possibility of a first home tie for Britain's women since 1993. Britain are in Europe/Africa Group 1 - a 14-team group divided into four pools that is played out once a year over a week. Two teams qualify for a World Group II play-off in April, two teams are relegated to Europe/Africa Zone Group II. GB won their three-team pool and will face Pool D winners Belgium on Saturday for a place in that April play-off. World Group II is an eight-team division played out over home or away ties - GB have not played a home tie since 1993. In the four years since Murray took over the captaincy they have twice come through Europe/Africa Group 1, only to lose away ties against Sweden in 2012 and Argentina in 2013. Murray's hopes were dealt a blow before the tournament started this year when Australian Open semi-finalist and British number one Johanna Konta withdrew because of illness, prompting the captain to call on Swan. The US-based teenager made her Fed Cup debut on Thursday with a victory against South Africa, but Gorgodze - ranked 197 places higher than the Briton - was a significant step up in class. The Georgian broke serve at the first opportunity for a 2-0 lead but Swan then took 10 of the next 12 games to build a decisive advantage. Leading 6-3 4-1, Swan held off a fightback and saved break points before closing it out after one hour and 31 minutes. Watson, ranked 85th, was far too strong for world number 226 Sofia Shapatava in the second singles match as she won in one hour. Jocelyn Rae and Anna Smith were beaten 6-2 6-4 by Shapatava and Oksana Kalashnikova in the doubles match. "Joss had a back injury which restricted her, especially on serve, and of course that's a little bit of a worry for Saturday," Murray told the LTA. Belgium will go into Saturday's decider as the favourites in terms of rankings, with Alison van Uytvanck their number one at 43 in the world. Murray added: "They have a strong team but I know enough about Fed Cup to know that rankings can go out of the window when you're playing for your country."